In week 3 of my quilt along we had to piece the strips of fabric that we cut. They went together in a specific order and were very easy to piece. The lighter shades went in the middle strip and the darker shades were sewn along each edge of the center strip. In the end we had nice long strips to work with. In week 4 we took our 60-degree rulers and cut the triangles. By alternating which side of the piece we cut from, each strip produced 6 triangles which will form the blocks. I don't know if I mentioned it before, but buying fabric like this, in a kit, it forces me to use colors I normally wouldn't. Still don't know if I like the dark blue in this set. We will see what it looks like in a few weeks when we lay the whole thing out. But for now I am thinking I just might make a few more strips of colors I like and totally leave the dark blue out. I finished the Thomas the Train Quilts for Kids quilt and I tried to photograph it when the sun was going down so the photos are a little dark. Each "plus sign" uses 5 squares of fabric. Of course, some of the plus signs on the edges of the quilt are only partial plus signs so I used the leftover few blocks on the back. I also had this fussy cut Thomas the Train piece of fabric that I could not figure out how to incorporate into the front of the quilt so I used that on the back by placing it in the middle and surrounding it with leftover fabrics from the front. I like making the back of these quilt look a special so the kid that is under it has his or her own special view of cuteness from the inside. I've been on the look-out for clearance fabric where I can buy whatever is left on the bolt to use on the backs of these quilts. This green striped fabric was one of those I picked up that way so it was nice that the colors went well with the rest of the quilt. A good problem I have is that I ran out of Quilts for Kids labels. With such a busy summer schedule ahead of me, I won't be sewing the label on until after the July meeting which means I won't be turning the quilt in until the August meeting. Here's to hoping I have a few more done by then! I finished BJ's quilt today. It took me longer than expected because I cut the binding 4-inches wide (so it ws 2-inches folded) and after hand binding three of the four sides, I realized that I did not like it. It was thick yet flimsy and just didn't look right. So yesterday I took it off and reattached it so it was only 1-inch wide. I spent the afternoon hand binding it then put the final label on today. I snapped these photos as soon as the sun came out so now it's ready to prep for shipping. Now if only I can find the right sized box. I decided to do this quilt along because the finished product had lots of angles and a nice selection of colors. I also liked that the facilitator had created a kit so I didn't have to decide which fabrics to use for myself. Of course, I did really like the fabrics that she was using so it was a win-win. The fabric line is called pearl bracelets. They are vivid and a simple, pretty design. There's plenty of white in this quilt as well which is one of my favorite colors. Yes, I love white. The fabric was at my doorstep within just a few days of my order. It was nice to not have to worry whether I would get it in time. We are in week three of the quilt along which means I should be piecing the cut fabrics. I haven't started that yet and hopefully I will get to it soon. That is the cool thing about quilt alongs, even though you can always catch up, it's nice to be a part of a group and keep up each week. It's like an unspoken nudge to keep going. I have a busy weekend but I have until Thursday to get the pieces sewn together...plenty of time! Today we delivered 95 quilts, 30 pillowcases and 17 fleece blankets to Children's Hospital of Wisconsin (CHoW). We loaded them all up in my car and Bonnie's car. Due to the HIPAA rules, we dropped them off at the corporate center where we were met by the director of the Life Enrichment department. There was no way we were getting into the hospital near the children. The hospital staff were thrilled to receive the quilts. Throughout my quilty adventure with this group I learned a lot about the different volunteer organizations that like to donate goods. So here's what I know. Quilts for Kids does just that quilts . period. The requirements are that they are to be made in new cotton fabrics, machine pieced, machine quilted and machine binded. 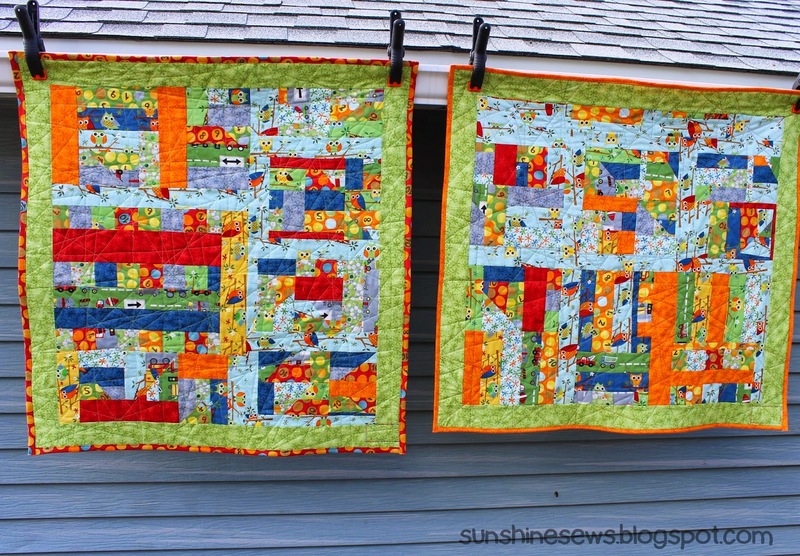 These quilts are designed for kids to be used and reused, washed and rewashed, over and over again. Even in an industrial machine in a hospital. They must hold up. They must be sturdy. There are other organizations that make knitted, crocheted, and/or fleece items and QfK does not allow those. And it makes sense. If a child is in a critical situation, anything fuzzy or itchy can cause issues. We did have 17 fleece blankets with us, but those are not tagged as Quilts for Kids sponsored items and the hospital agreed to accept them - they would send them over the the ER for their use. They clearly wanted the quilts. After Renee, the Milwaukee chapter leader appeared on The Morning Blend and Fox Six -Milwaukee, she received donated sewing machines as well as fabric. And the coolest thing happened, the hospital could really use a machine. They were currently sharing one with the Ronald McDonald House so they would haul it back and forth between locations. And now they didn't have to share. They could each keep a sewing machine at their own locations. So we had that packed between the quilts as well. It was a very rewarding day, the response from the people at the hospital was worth the work.